How high must lactate be to predict an adverse outcome? We aimed to clarify the associations between lactate levels and ICU mortality and their changes over 6 years in one ICU. All patients admitted to the general ICU of university hospital from 2005 to 2010 were studied. 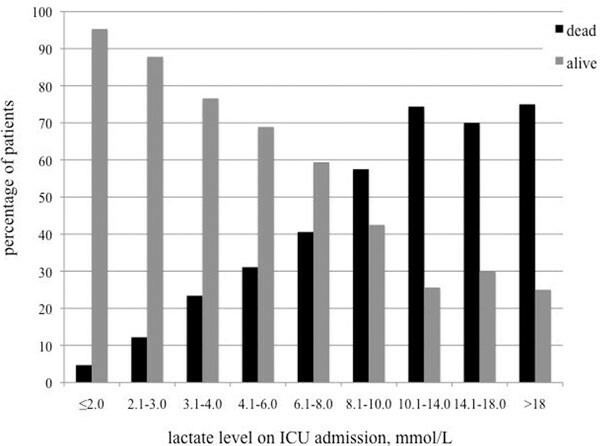 Highest lactate on admission day in the ICU was documented. In total, 1,830 patients were treated, 417 were excluded due to incomplete data and 1,413 patients were included in the study. Survivors had a mean blood lactate level of 2.8 ± 3.3 versus 8.9 ± 7.2 mmol/l in nonsurvivors (P < 0.001). 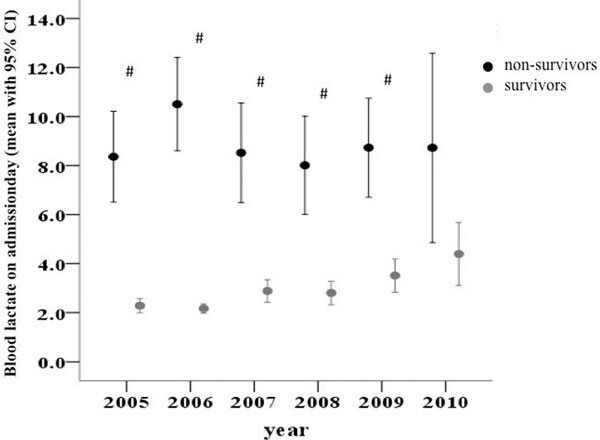 The lactate levels of survivors versus nonsurvivors over the years are presented in Figure 1. The survival in different lactate groups is presented in Figure 2. Lactate levels of survivors versus nonsurvivors over the years. #Difference between survivors and nonsurvivors, P < 0.005. ICU survival rates according to lactate levels. There is a linear correlation between blood lactate levels and ICU mortality. A considerable amount of patients with very high lactate levels survive the ICU. There is no certain lactate level that may reliably predict an adverse outcome.